When bad things happen to us, the first question we usually ask is, “Why me, Lord?” But “Why?” is such a useless question in those instances. Why? Because there often may not be an answer readily available, and as Lisa Bevere, Christian author and speaker once said, “Even if you know why, you’re still messed up.” Thus, “Why?” is just plain unproductive. 1. How can God be glorified in this? I began to ask, how can God be glorified by me having acid reflux? When God heals diseases, He makes Himself visible, so to speak. The answer is that God is going to give me the opportunity to testify about His power and goodness when He heals me of this illness. When my healing manifests in the natural realm, I will obtain another validation of His existence. When God performs a miracle, He points the world to Himself and allows us to peek behind the spiritual curtain and catch a glimpse of His divinity. Ask God how He can be glorified in your situation. 2. What lesson can I learn? Because I am desperate to be healed of acid reflux, I have had to learn to seek God even more intensely. This dsease could eventually become a life or death situation if not arrested promptly.Therefore, I have sought out principles about how to obtain healing. I’ve watched healing DVDs, scoured the Word, meditated on scriptures, and will I continue to do everything I know until the healing manifests. Through this ordeal I have learned to exercise my faith in a greater way. Hopefully, I will be able to articulate truths about healing to others once I have proven them to work in my own life. Therefore, we should always seek out the lessons to be learned in any adversity we face. 3. How can this work to my advantage? Romans 8:28 says, “All things work together for good to them that love the Lord and are the called according to His purpose.” This illness has definitely brought me closer to God. In my desperation I have had to seek His face like never before. I was compelled to find out exactly what the Word of God says my rights are as a believer in regards to healing. As a result, I feel my bond with Him has deepened and the intimacy in our relationship has increased. I am grateful for that. Also, when I meet other challenges in my life, I will be able to apply the principles I have learned from this episode to other situations that arise. I will know how to get the results I need and want. If you ask Him, God will reveal to you how the situation you are facing can work to your advantage. So the next time you are tempted to ask God “Why?” why not ask these three questions instead? God is willing and eager to provide the answers. He wants to be glorified. The Holy Spirit wants to teach you and guide you into all truth, and the Father promises to work all things for the good of them who love Him. When adversity comes your way, if you ask the right questions, the answers you receive will help you to grow in your faith and increase the intimacy in your relationship with the Lord. 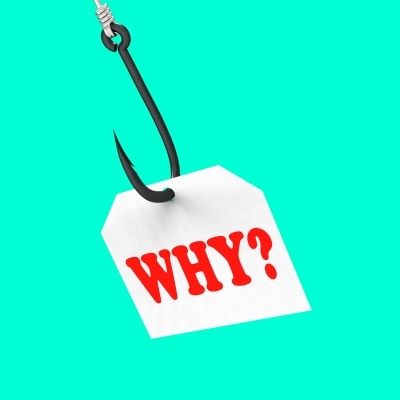 What are your thoughts about asking “Why?” Leave a comment below.